Absolutely beautiful home with spectacular west facing mountain & lake views. 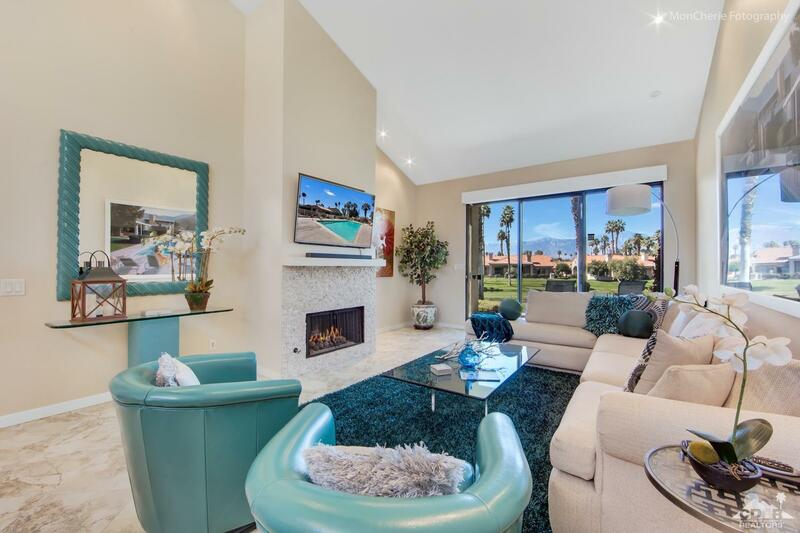 Completely remodeled palm plan with den. Great open floor plan. Striking custom finishes include custom cabinets soft close with pull out shelves, stainless steel appliances, caesarstone countertops, custom oversized island, large ceramic tile floors, automatic custom blinds, bright skylights, wifi nest control. Beautiful remodeled bathrooms with large walk in frameless shower doors. Enjoy your morning coffee in private courtyard and sunset dinners on patio with spectacular lake and mountain views. This home can be controlled from your phone, locks, light, thermostat, blinds and cameras. Home is just steps away from community pool. This fabulous home comes turn key furnished, just move in! Palm Valley CC has it all, golf, tennis, exercise and more. HOA includes social membership to club, cable TV, outside maintenance and landscaping and more! Seller very motivated bring offers! Included in Sale: All furnishing per inventory list.